Think baking a whole chicken is hard? Think again! This Rosemary Dijon Baked Chicken is so simple to make, plus it is a great way to feed a crowd for less. Since you can buy whole chickens for around $1 a pound, you can make a good five pounds of tasty chicken for around $5. Take a peel below at how we used rosemary and Dijon mustard to create a dish that is truly scrumptious! First, unwrap your chicken and remove any insides (gizzards) that may be present. If you buy one like we did, the insides are already removed so all you need to do is rinse it out well with warm water. Take a length of string and tie the legs of the chicken together. This will keep it moist when cooking. Place the chicken on a baking dish breast side up. You may wish to spray the dish first with a non stick spray. Start seasoning your chicken by melting your tablespoon of butter and brushing it over the entire bird. Next brush on a layer of Dijon mustard. Be as generous as you wish. Sprinkle the chicken with the seasoning salt, ½ of the crumbled herbs, salt and pepper. Take the reserve of herbs and place them inside of the chicken for some extra flavor. Cook the chicken at 375 degrees for 20 minutes per pound. For our 5 lb. chicken, we needed to cook it for about 100 minutes, or an hour and a half. It will feel like a real feast when you remove your golden chicken from the oven! The flavors of the herbs, butter, and mustard will all blend beautifully and create a dish that tastes just as good as it looks. 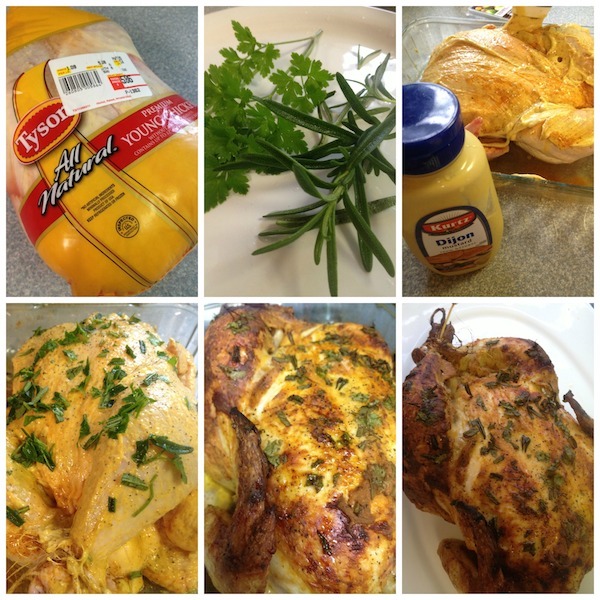 Give this Rosemary Dijon Baked Chicken dish a try and see how easy, inexpensive, and tasty chicken can be. Of course roasting a whole chicken is easy! In fact if you are going to heat up the house with the oven why not roast two birds to use throughout the week on a Sunday or whatever your free day is. Having already cooked chicken with amazing flavor and llittle preservatives readily available throughout the week is an amazing time saver. That looks really good! I bet you could do it with just the chicken breast, too, right? This looks delicious. Love simple, easy recipes. I love roasting my own chicken! There’s so many different ways you can season it, and it’s so easy to do! That looks delicious! I love the smell of rosemary baking. That looks really yummy! I’m not a dijon fan, though. This looks really good and flavorful. I have never cooked a whole chicken, so I would like to attempt it soon. This recipe sounds delicious and similar to one I make using lime juice instead of rosemary. This looks delicious!! I’m lookng for some new chicken recipes. I’ve done this before with Chicken Breast on the bone. We don’t eat dark meat so unless we’re having guests I usually don’t bother with a whole chicken. Oh, I can just smell and taste that chicken now! Yummmmm! Oh man, this looks absolutely delicious! I’ll be making this real soon! Yum this looks so good and I love how it is affordable! I would totally make this for sure! Looks pretty simple and delicious! Going to try it. This rosemary Dijon chicken sounds great. I’ll have to try it sometime. This looks and sounds awesome! We’ll have to try it for dinner when we are back home after our trip! Just from looking at it, you can see how much flavor it must have. Looks so good! Wow this sounds like something my husband would love. Thank you for sharing. That looks great. I need a good fail proof recipe! Mmm this looks really tasty! I love rosemary. This recipe looks and sounds perfect. Look forward to giving it a try. My family may thank me. Looks absolutely delicious and I am definitely going to try out this recipe! I have my own fresh herbs and will be using those when cooking this for sure! I love the pic of this fabulous chicken recipe! Thanks so much for sharing! I will definitely be trying this recipe out! Looks delicious! I’ll give it a try next week! Never woulda thought of putting mustard with rosemary.Guess that’s what’s for dinner tonight#stoked! This sounds good! I think I will try this in my crock-pot sometime. Pinning to save and share! Thanks for the recipe, this sounds really good. I plan to make this for Sunday dinner, I always have my family over for a big dinner and I am sure this will be a hit. I love bake chicken. That looks so delicious. Love this recipe! 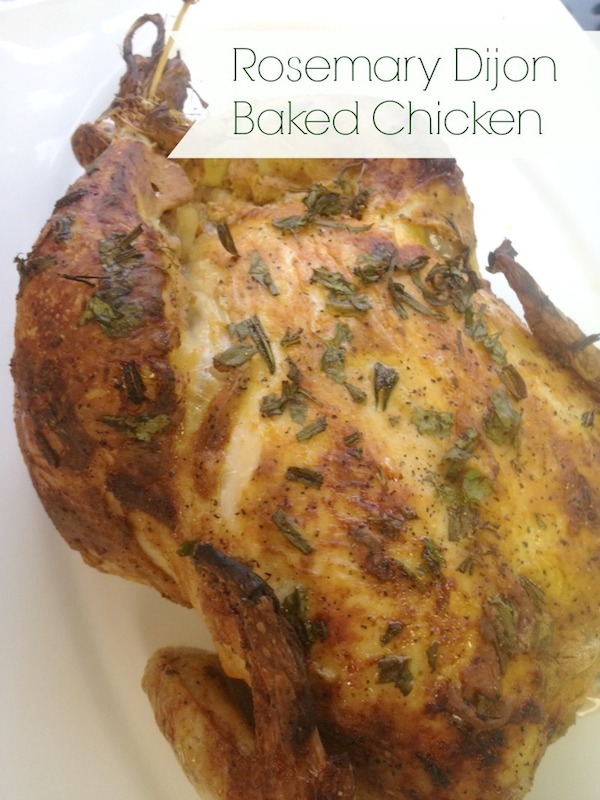 I have a craving for baked chicken right now after reading this! This looks so yummy! 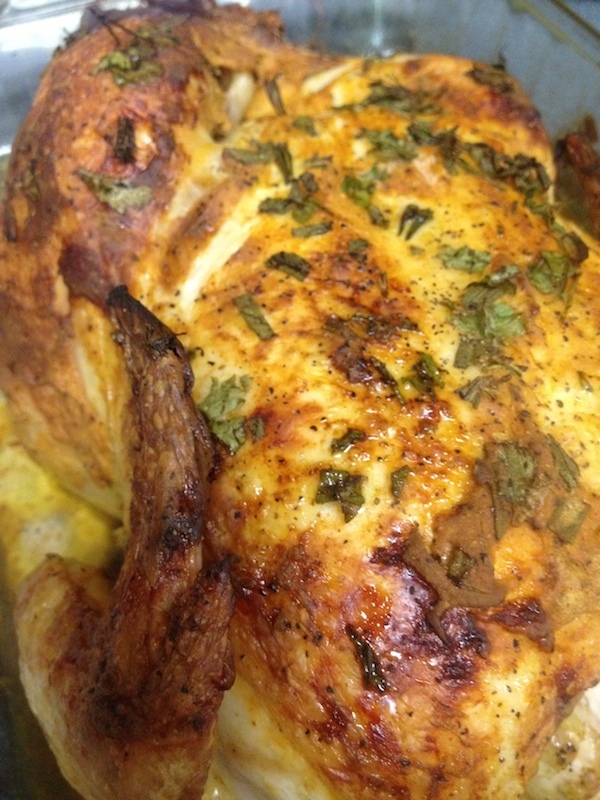 I have a roasting chicken in my freezer and this is what I am going to do with it! We are always looking for different ways to prepare chicken! the chicken looks and sounds delicious. I like rosemary as a seasoning. I will try this recipe. Hopefully my chicken comes out looking as beautiful as yours.